Coming within a touchdown of a Super Bowl appearance and with their core players locked up for the immediate future, the Bears are in about as good of position roster-wise as any contender next year. But as the loss to the Packers proved, the team needs help to get over the hump. With a talented young roster and All-Pro quarterback, the Packers will be good for years to come. The up-and-coming Lions finished the year with 4 straight wins and will be dangerous next year. While a potential lockout will impact player movement at some point this offseason, the draft will go on as scheduled. What will the Bears do to strengthen their roster? Here’s our best guess at answers to the most important offseason questions facing Lovie and Jerry Angelo. 1. Who gets an extension? The biggest decisions as far as expiring contracts go will focus on starters Danieal Manning and Olin Kreutz. With Chris Harris and Major Wright in tow, Manning is expendable. Besides, he’ll probably command more money on the open market than the Bears will want to spend on their 3rd safety. Kreutz has been a cornerstone of the franchise for over a decade. Lovie Smith and Mike Tice would like to have him back, especially facing the prospects of another year of uncertainty across the line. Look for #57 to bring his leadership and stability back to the Bears for the remainder of his NFL career. While he still has a year left on his contract, Matt Forte’s strong season earned him an early extension. He’s one of the top 10 backs in the league and will be financially rewarded accordingly. Greg Olsen has one more year on his contract, and I suspect the Bears want to see more from him before they decide to extend. Of course the most important extension decision revolves around Lovie, whose contract expires after next season. Jerry Angelo has said publicly he intends to stay with Lovie, and Lovie’s said publicly he loves the Bears…so look for the lovefest to continue for years to come. 2. How will Cutler respond to an offseason of questioning and criticism? Cutler was ridiculed by just about everyone who wasn’t a Bears fan, coach or player for not finishing the Packers game. But after surviving the physical beating he endured on the field this year, Cutler proved his worth to the people who matter most. His confidence won’t be shaken by outside influences. With another year to perfect Martz’s offense, a solidified line and potential new playmaking receiver, Cutler could land in the 2012 Pro Bowl. 3. Can the Bears effectively makeover their offensive line? Without a doubt, the biggest question mark going into the offseason is the starting front five. Jemarcus Webb has the best all-around tools (and upside) of any current Bear linemen and he’ll man one side of the line. Chris Williams doesn’t have the body/skills to battle the big uglies inside – just ask the Packers’ mammoth defensive tackle Cullen Jenkins. They’d be best served moving him back outside to compete with Frank Omiyale for the starting spot opposite Webb. Regardless of whether Kreutz returns, the Bears must bolster their interior line, either through the draft or free agency. Roberto Garza is solid, not spectacular. Lance Louis has the physical tools and mean streak you want in an interior lineman and will probably get another look this offseason. A guard or center like Mike Pouncey of Florida will warrant a close look in the draft. 4. Will the Bears find a true #1 receiver? 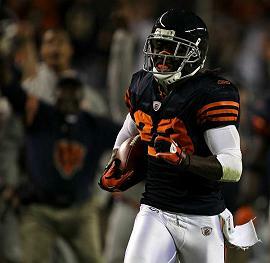 Johnny Knox, Earl Bennett and Devin Hester are all nice complimentary players. But none of them has stepped up and become Cutler’s go-to guy…you know, the dude everyone in the stadium knows #6 will look to in those crucial 3rd and longs. I’ll admit, after whispers that the Cardinals’ brass could make all-world receiver Larry Fitzgerald available for the right price, I’ve dreamt of a scenario where the Bears make a move. But after shipping their last two first-round picks to the Broncos in the Cutler deal, Angelo can’t afford to part with any more first rounders, especially with multiple needs across the roster. The free agent market holds some intriguing possibilities: Vincent Jackson, Sidney Rice and Santonio Holmes are the best available (although Rice and Holmes will probably resign with their respective teams). As far as the draft, two SEC standouts – Julio Jones from Bama and AJ Green from Georgia likely won’t be around when the Bears pick at #29. Any other receiver would be a stretch with that pick…especially for a guy that would need to step in immediately. A trade for a proven WR (not named Fitzgerald) seems to be the best chance for a quick upgrade. 2. Jay Cutler will continue to play well as his comfort level in the offense goes up and his support cast gets better. 4. I remember Mike Martz twisting the arm of Rod Marinelli, leaving him voice mails from “Calvin Johnson”, to hope to convince them to draft him. The Bears can’t afford to go wide receiver first round. Jerry’s draft record of wide receivers has been awful. While other teams like Atlanta draft receivers who stick around through coaching changes and remain productive, Chicago has drafted Derek Kinder, Juaquin Iglesias, Marcus Monk, Mark Bradley, Airese Currie, Bernard Berrian, Bobby Wade and Justin Gage. None of those players are on the Bears anymore, and the two that are still in the league – Justin Gage and Bernard Berrian – are not starting on any team. As for the Bears’ starting trio, during 2009 mini-camps, Lovie Smith labeled Devin Hester a “legitimate #1 receiver”. He is yet to have 800 receiving yards or 5 receiving touchdowns in a season. Earl Bennett got a nice push-off to get open for his touchdown against Green Bay. He’s a classic example of a guy who did great in college but probably isn’t the prototypical beast you would want to take as early as round #2. Johnny Knox seems to have the most overall ability but also had 11 interceptions thrown on him in the regular season and another one against the Packers in the Championship Game. I believe Johnny Knox will put up much better numbers once the offensive line improves, giving Martz the ability to use more of his plays. He’s the only guy who should be secure in having a roster spot next year.